E. G. Shrink Film coded SBZEL would have 10%-20% shrink in Transverse Direction 60% and above shrink in Machine Direction and Extra Low Slip. Most films without additives give a reasonable clarity but, as the thickness increases, the clarity decreases. Where a high clarity thin film is used, the packaged property can be clearly seen. The clarity is also affected by any additives, such as Linear LDPE, which will reduce the clarity. Also, if coloured film is required, the thicker the film then a better opacity of film can be achieved. It is virtually impossible to obtain a 25micron film that is totally opaque. 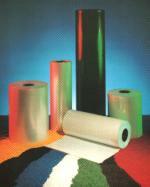 Films are mainly supplied as either Low or High Slip. High slip film is more suitable to films that require easy opening for packaging such as produce bags. Low slip films are often used in shrink or other applications where the product needs to be palletised or stacked with stability is a safety requirement. It is recommended that the customer ensures the correct slip level of film required before ordering. The table below gives an indication of the film yield for various thickness of material. Any other thickness can be calculated on a pro-rata basis. The second table enables the actual weight of film required for each pack. This is a useful tool to use when calculating the actual cost of the film used for each pack. Prices are available for all our products on request. Should you have any questions or require further information please phone 0161 428 4251 (fax 8329) or e-mail trevor@polythene-films.com.